Eyecon games are hoping The Luck Of The Irish will be with you in their 5 reel 25 payline slot, Irish Luck. 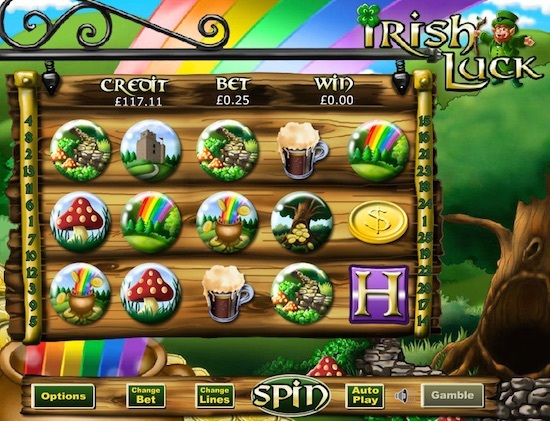 Hit the rainbow road and see if lucky clovers, pints of the black stuff, castles and leprechauns can help you spin your way to big wins. You can play Irish Luck at Slots Gold from just 1p a spin. Select the number of lines (1 to 25) and bet size (1p to £2) to set your wager. The maximum wager is £50. An Auto Play button gives you the opportunity to set 10, 25, 50 and 100 games to play whilst you sit back and relax. Irish Luck has a number of interesting features including the Word Combo win line. Spell the word "IRISH" from left to right on the reels to win x3000. This is the top prize on the game with the lucky money tree following behind with x1000 for a line of five. Three leprechauns on the reels will trigger a Prize Pick bonus round. Each pick reveals a fairy or leprechaun with the latter generating 10 free spins whilst the former gives a multiplier prize up to x100. Prizes are awarded together! Irish Luck also has a Fairy scatter feature. This activates when three or more fairy symbols appear on the reels. A pairs game is played with the player selecting four leaf clovers until a multiplier match is made. The matching pair generates the value of the prize. The four leaf clover symbol represents this game's wilds or substitutes. They only appear on reels 2 and 4. Prizes are doubled when they appear in a win line. Finally, you can try to double any wins with the 'Gamble' feature. Select the 'Gamble' button after a win and then choose leprechaun or fairy. If you select correctly then you double your prize (and can play on) other wise you lose! Irish Luck is full of features which more than make up for it's retro look. We think these features are why the slot remains one of the most popular at Slots Gold. Play Irish Luck on mobile, tablet and desktop!